Ribs are a feature in plastic injection molded parts. Ribs are thin extensions that run perpendicular from a wall or plane. They are commonly used to provide additional support and strength to a part. The material or materials being used for the part should also be considered when designing for resins. Depending upon the resin, rib thickness should be a percentage of the wall thickness. 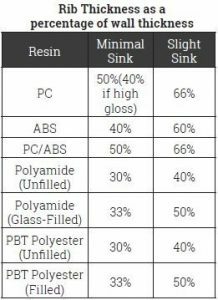 Refer to the chart below for some general resin allocations. An advantage of using ribs is that they increase the strength of the part without increasing wall thickness. Walls that are too thick can sink, warp or result in other defects. Their integration into a part results in less material usage; therefore a more cost effective solution. Working with an injection molding manufacturer who is experienced in working with ribs can not only lessen your risk with production issues but also save costs and time in the long run. Submit a design to one of our Technical Specialists today for assistance at 586-598-4636 or sales@xcentricmold.com.